If you missed this morning’s assignment, you can check it out here. So, do you all want to know the truth? I haven’t cleaned my oven since we moved to this house. I’ve wiped up a few spills, but haven’t given it a serious scrubbing since we moved in almost two years ago (wow, has it really been that long?!). Some of you are probably reeling from shock just thinking of how horrific that is that I wouldn’t clean my oven on a weekly basis. At any rate, I got out the baking soda and started scrubbing this morning. Honestly, it wasn’t that bad at all. But I did find some burned on gunk on the racks that was very persistent. I finally gave up on getting it completely off (anyone have suggestions for how to miraculously take stubborn stuff off oven racks?!). I also discovered this at the bottom of the oven. 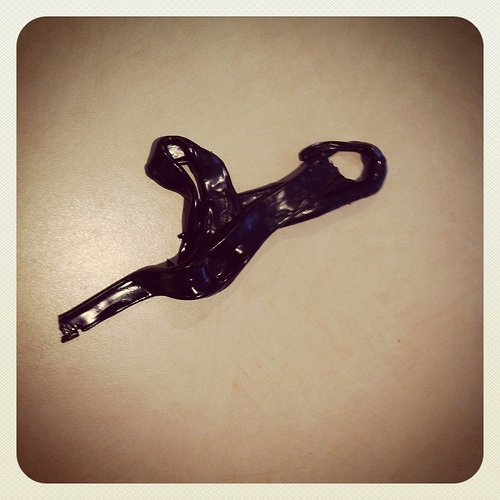 It appeared to be some kind of hard plastic. I’m not sure what it is or how long it’s been in there but you would think that if it were plastic, it would have smelled like plastic every time I used my oven recently, right? So I have no idea, but I’m glad to have it out of there. I also cleaned out the drawer underneath the oven while I was at it. It was in dire need of cleaning as it seems to be one giant crumb catcher! And finally, I tackled the stovetop and the microwave, neither of which were too bad since I do clean those on a regular basis. My pile of 7+ things to get rid of today — mostly well, well used foil pans I found stashed in the drawer under the stove and decided were well past their prime. How did you do on Assignment #12? I’d love to have you share your progress and success with us so we can be inspired. Either post a link to your blog post below or leave a comment with your update. I am one of the ones breathing a big huge sigh of relief when you say you have not deep cleaned your oven in 1.5 years. Mostly because we have lived in our home 3 years now and I just deep cleaned our “new” when we moved in oven for the first time a few weeks ago. HORRIBLE I know. I was just so busy renovating our rentals so they could finally be rented! I never made it a priority. Do your 7 things go in a garage sale pile or are you actually getting rid of them daily? Just wondered. Mostly garage sale, unless I’m passing them onto someone. I’m horrible about cleaning my oven. 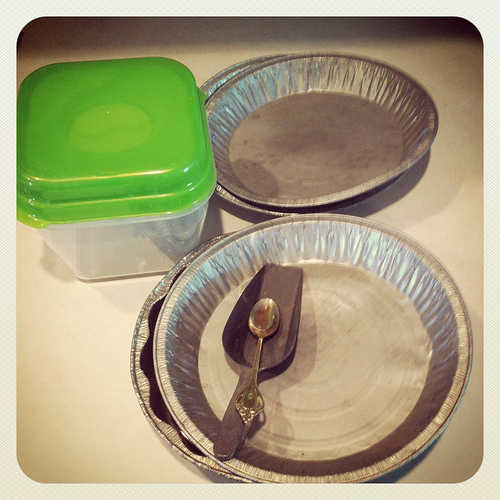 Lol…BUT it doesn’t get that messy because I keep foil down under my pans that might spill over. But the other night I put something in the oven and I’m SO thankful that I opened it like 2 minutes later to check it and something in the bottom was on FIRE. I yelled at my husband and started blowing the fire out. So, we let it cool and I scrubbed it (with baking soda). It was a spot of something about the size of a half dollar…and my oven wasn’t messy at all aside from that. But my husband brought his grill scratcher in and I used that on the racks, it did an AMAZING job of scrubbing them. You might give it a shot. I wouldn’t feel too bad about the oven if I were you, or the amount of time. It’s just not something you think about, unless something dripped and you smell it when you turn it on. Did you ever find out what that plastic thingy was? Sorry, saw the answer on your assignment #1 post. Okay, seriously….We’ve lived in this house for 7 years now. I ran the clean cycle on my oven ONCE a year or two ago. I didn’t actually wipe it out afterwards, either. Plus, my cooking always boils over. The inside of my oven is something I just don’t really care about! Haha. The microwave, on the other hand, gets sprayed and wiped with vinegar regularly. When we were building our house, one of the older ladies I worked with told me to invest in a self-cleaning oven. After 10 years I have to agree with her. It is so nice to just push that button and be done. I just cleaned my oven for the first time since we bought it 4 years ago! It really wasn’t that bad, but still. I just used the self clean cycle. Do you have one on your oven? That took everything off. I just wiped off the ashes when it was done. Easy peasy! I even left my pizza stone in while it cleaned and it looked brand new! For the racks, try taking them outside on a nice day, spraying them with oven cleaner and putting them into a garbage bag. tie the bag and let it outside for a few hours. Then open and wipe off. It works well. I also take a small amount of olive oil and grease the sides before I put them back in the oven. Hope this helps! 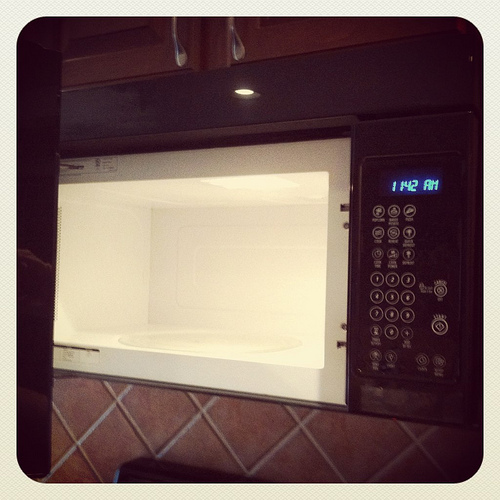 Best part of no longer using the microwave- no longer having to clean the microwave! LOL!! I can’t believe how dirty my microwave was! Yuck! Thanks for this task though, it never gets done as often as I would like. I don’t mind cleaning my microwave. I have a couple different sure fire ways that are relatively easy! Take a cup of vinegar (any kind!) and stick it in the microwave for 3-5 minutes. It will loosen all the gross stuff on the sides/top and you can wipe it all off with little to no elbow grease! Or you can use a cup of water with some lemon or lime juice squeezed in and follow the same instructions. I NEVER have to scrub – just wipe! And I just throw the glass turntable thing in the dishwasher! I don’t mind cleaning my microwave at all! I just put a cup of either vinegar (any kind!) or a cup of water with either lemon or lime in the microwave for 3-5 minutes and then wipe it down. It doesn’t even take any elbow grease because the steam from the liquid loosens everything! Then I just throw the turntable into the dishwasher! This works way better than scrubbing and scrubbing and is all natural! Now my stove top/oven…those are another story! Hey, the piece of plastic looks like one of those ties from the oven bags you cook a turkey or roast in. They are designed to take high heat, and might explain why it doesn’t smell or melt more when the oven is used. Congrats on tackling the oven! I found a GREAT tip for cleaning oven racks before moving out of our apartment last year – which we lived in for 3 years and had a brand new kitchen installed when we moved in meaning a brand new oven. The racks were looking rough but if you put your racks in the bath tub (towel below if you are worried about scratching the tub) add the hottest water you can get to coverthe racks and a generous scoop of laundry detergent (I used powder can’t speak for liquid) and sit over night. I couldn’t believe it in the morning all my racks needed was a wipe with a cloth and the were looking brand new. So easy! thanks! I bet this would work great for grill racks too! If you live in the south, land of fire ants, you can put your grill rack on an ant bed and they will clean it right up. Wash well afterward of course! Great tip! Thanks for posting! I don’t think it’s bad at all….the oven is sort of hidden…something that isn’t right in our face all day, so we don’t see how dirty it can get. The way I know that it’s time to clean my oven is when it starts setting off my smoke detectors when I bake. The smoke detectors are so sensitive that if we have any little bit of spillage in the oven, it will smoke a bit and the alarms start going off! I am also one of the ones breathing a sigh of relief. It took an upcoming move to motivate me to clean my oven a couple of weeks ago and it had been a long time. I used steel wool pads on the oven racks and it worked great on the stubborn stuff. For oven racks, put in a big bag with a cup of ammonia, close the bag, leave overnight, wipe off in the morning. this is what I was going to post. I read this some place…. also works on the grates for the burners…. I think I read this on pintest…. I was going to post this too. Tried it for my grill racks and the also the plates (or whatever you want to call them) under the coils of my electrive stove and it worked wonders. Just saw a tip for cleaning dirty oven racks here http://www.picklee.com/2012/04/13/10-remarkable-diy-cleaning-solutions/#.T4isz9WlfNI I haven’t tried it though. We are in a rental, so knew we would not be here forever, but it has been a year and I have to clean the oven before we move out…………..I am dreading that task the most of all. I bought NEW drip pans for the top, easier and the old ones just never come clean…new house has a smooth top for which I am thankful. To truly get the racks super clean, spray with oven cleaner and put them in a black trash bag like overnight or in the sun all day, then just wipe/scrub off the next day. Cream of tartar and white vinegar will take off baked-on egg, so maybe it would work for the oven racks too, if nothing else will? Ah………self cleaning………..the “luxury” you take for granted until you go back to non-self cleaning…………..
Pour about 1/2 to 1 cup ammonia into a black trash bag. Place racks inside the bag. Seal and set the bag outside in the sun for several hours. The black bag will absorb sunlight and warm the ammonia, which will vaporize and soften the gunk on the oven racks. 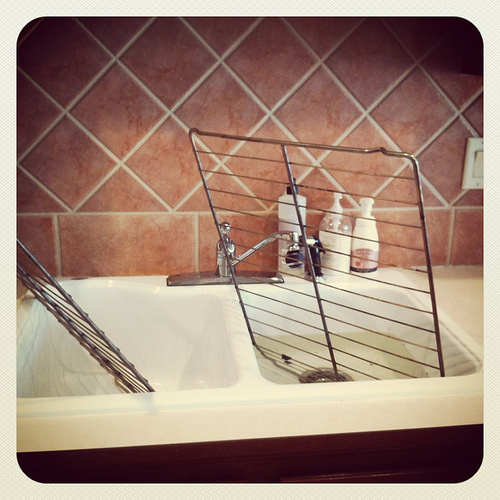 I second this – I didn’t do it for my oven rack, but for the burner grates that were impossible to clean. It really does work! A tip for cleaning drip pans: place the old ones in a stock pot filled with water, add a couple of tablespoons of powdered dishwasher detergent, and boil for awhile. The gunk will wipe off surprisingly easily. I use ammonia and a garbage bag for my racks and burners. Put a teaspoon or so of ammonia in a garbage bag, put in all the oven racks and seal it up. Let it sit overnight or a whole day. They clean up very nicely. I had the same issue w/ my racks, but steel wool was a big help! Not fool proof, but certainly much better than a regular rag or sponge. I also found that baking soda helped (actually cleaned the whole inside of the oven w/ baking soda and water). My fav cleaning product is Bar Keepers Friend…you usually find it in the cleaning aisle near Comet. It was recommended to me to use for my stainless pans and works great for a lot of other things. Just wipe it on with a sponge, let it sit for 30 minutes to 1 hr, then wipe off and rise. It looks darn near brand new! I love it! I’m still proud of myself though. I was able to give the children their baths today, push through our morning routine, get my shower, do one load of laundry, feed everyone and clean up afterwards, and get my son’s reading and handwriting lessons done today. 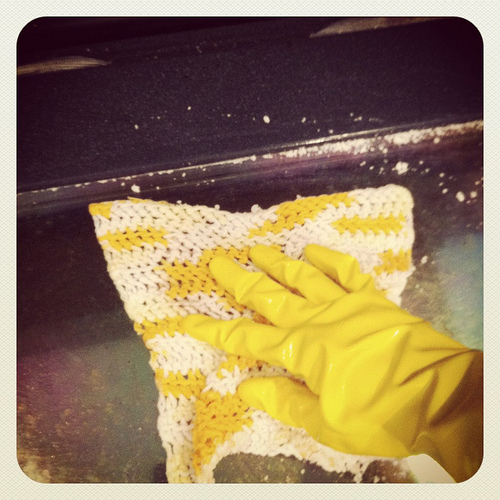 Chore Boy stainless steel scrubbies are MIRACULOUS! They are shredded up stainless strips. They don’t rust like steel wool. I add a tad of soap and make them wet, then scrub any baked/cooked on stubborn stuff like egg, cream of wheat, etc from my pots and pans as well as my toaster oven rack. I would expect them to work on your oven racks, too! They are reasonably priced and you can use them a long time! I’m glad, too, that I’m not the only one. I guess the oven is one of those jobs I don’t think about. I think it’s been a good two years. Thanks for posting! Finally back to organizing today! Was too busy preparing for my sister’s baby shower to do anything else last week. I have to admit that I was happy to see this assignment and gladly did it–all I had to do was hit a couple of buttons on my oven and it cleaned itself:) I am getting baby clothes around to sell at a Mom 2 Mom sale, so I’ve tagged 4 totes of clothes and shoes to get rid of! And I’m not done yet, I have more totes to go through and am going to find toys that are headed to the sale too! I’m always afraid the self-cleaning feature will stink up the house or release chemicals of some type. I have No Idea why I think this (LOL) but can anyone confirm or deny if your self cleaning option ends up stinking the house with a chemical smell? Mine always makes my house stink something terrible; it almost smells like burning plastic. I don’t know why … even though the oven is 10 years old it still smells when I use the self-cleaning feature. I always make sure to do it on a day when I can open all the windows, and preferably during a time when the kids aren’t around. Yes, my house stunk!!!!!!!!!!! My husband was home, so he turned it on and when I got home from work, it really smelled awful. He had doors and windows open… I’m really not sure how to avoid it. Anyone know? The first couple of times I used self clean it smelled, but I had windows open. Now there is little or no smell. It does stink, but it just gets very hot to burn everything to ashes so there’s no chemicals involved. I’d do it on a day when you can open up the windows. Personally I’d rather use the self-clean feature than use chemicals in the oven, even if it is stinky. I clean houses part time and the best thing I have found to clean ovens out with is a pummice stick. Not the kind you use on your feet but the actual janitors kind. (they are called Pumie scouring sticks)You can find them at walmart in the cleaning aisle or on amazon and they are AMAZING!!!!!!! They also work REALLY good at getting stains and rings out of toilets. It literally only takes me a couple of minutes to clean out a horribly dirty oven. I’ve also used them on tough spots on oven racks as well. Thank you, thank you… I am also one that does not clean my oven on a weekly basis, and this project is definitley on my to do list. The reality of life is so awesome, I can’t tell you how much I appreciate it. I am excited to tackle mine, yours sure did look great afterward. Wonder if it makes the oven work better or food taste better…lol. Don’t toss out the aluminum foil pans, we put them in our aluminum pile that the kids take to the scrap recycler in town twice a year, all of the money they earn goes in their savings account. My secret cleaning tool is a Magic Eraser!!! The Target brand works just as well, too. They are amazing for getting coffee stains out of mugs, rings out of the tub, and stuck on/burnt on food out of microwaves and ovens. I don’t have a smooth top stove, so I have to clean out the pans under the burners every couple months. I use black pans to start with, so I wouldn’t have to get out each and every little burnt crumb, but the magic eraser cleans them up like new! You know how cookie sheets get sort of burned looking, especially on the edges? It takes some time and elbow grease, but with a Magic Eraser, they really can stay looking like new. Hope that helps someone else! I am a huge fan of Magic Eraser too. I have found that you can run them through the washer and dryer once or twice when they get grimy and it really saves money instead of buying new ones. You must be joking about cleaning anyone cleaning their oven once a week. I can’t remember the last time I cleaned mine. It never looks clean anyway, so unless it’s really gunked up, I don’t think about it. My oven/stove is circa 1955! I am going to try the pumice stick on mine now! 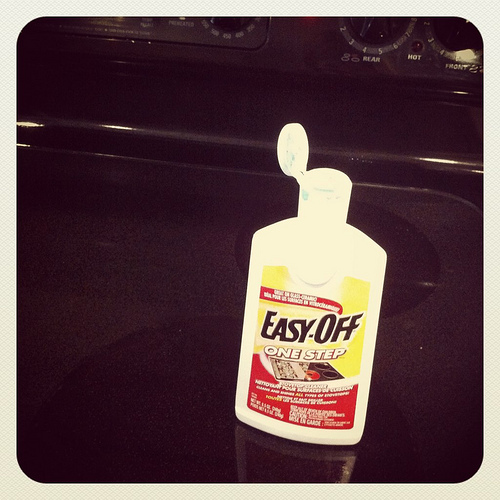 How do you clean enamel on the stove. I was told to use only a wet paper towel but it doesn’t take care of everything. I decided to try out the “self-clean” option on my oven for the first time last night. I’ve had the stove for over a year and have never cleaned it. Well, the fumes from the “self-cleaning” oven were so bad, I had to air out the house! I don’t know if it was because I was using it for the first time, or if it will always be that way… Nonetheless, the oven is very clean now. 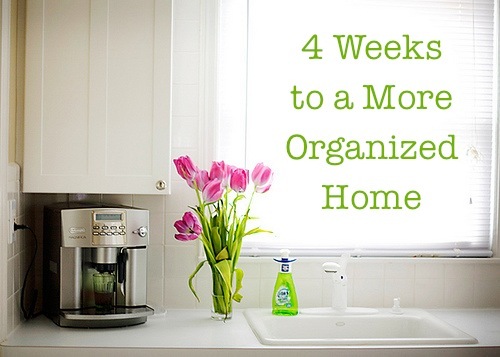 The first couple of times it will smell strong so make sure to do it on a warm day when you can have windows opened. The more you use it, the less it will smell. After 10 years of using the self cleaning maybe once a year, there is little or no smell now when I use mine. Thanks for the comments ladies. I’m glad I’m not the only one that had to deal with the fumes! Hopefully mine will gradually disappear too. ok, 2 questions for everyone…Doesn’t your self clean oven stink when it’s on such high heat? I can only do it when I can open up the whole house because it just stinks! Is it just my oven? 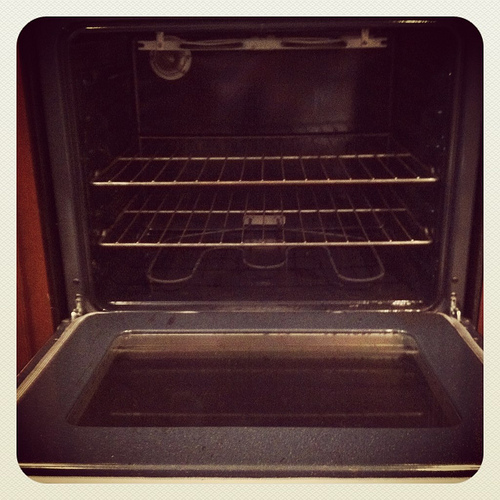 One more question…I have gas on top (electric in the oven though) For the gas burners how do you clean them? Make sure you avoid getting the gas outlets clogged. I suggest using a paperclip to scrap them out. Also, you can use soapy water to clean the actual gas ring. I use vinegar and water most of the time and use a damp sponge to scrub them. Good Luck! We’ve only used our oven a couple of times since moving here last August so the oven was dirty from the previous owners. I’m sorry but baking cookies does not make your oven as dirty as ours was. I cleaned it with baking soda pasta and peroxide! Was easy! Hopefully you will see this post! Those metal baby spoons are very very hard to find! You may want to consider keeping those for your children, I wished that I had those when my youngest 3 were babies but I had gotten rid of them after the first two and regretted it ever since! As far as the oven cleaner I would reccomend that blue bottle of name brand oven cleaner that stuff is AAA-mazing! I remember seeing a way of cleaning your whole oven (and I’m assuming the racks) that uses ammonia sitting in it overnight. Google it, and I’m sure it will be easy to find. I keep meaning to try it but haven’t had a chance yet! Let me know if you do. For the burnt stuck on stuff on your wire racks try a magic eraser. I know I use mine to get grease and burnt on stuff off my pots and pans. Try steel wool for that metal oven rack with the burnt on gunk. It works amazingly! 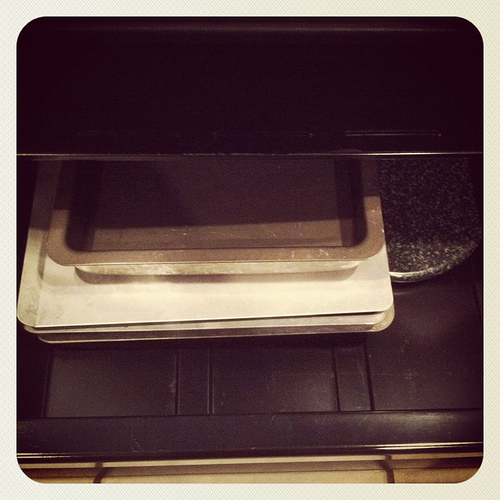 For the oven rack you can try this trick I use for my stovetop grates. I put them in a plastic bag ( you could use a garbage bag) with a little ammonia. You don’t need a lot of ammonia, it’s the fumes that do the cleaning. Let sit in the bag overnight. The fumes are awful when you empty the bag but it works like a charm. No scrubbing needed. I can beat you on that one….hadn’t cleaned ours in about 10 years! I was intimidated by the whole idea but of course, like many things I procrastinate about, once I did it, it wasn’t so bad and I thought why didn’t I do it sooner!! Have you ever heard of “Awesome”? I get it concentrated at Dollar General whenever it’s available. There’s another customer who waits for every Tuesday for the shipment to come in and beats me to it at times. It’s a degreaser that truly IS Awesome! Just spray on as directed and leave for an hour or so (depends on the build-up). Then, with rubber gloves on, use some of your left over foil (from other meals etc.) and go over each wire like a breeze! (I’ve also used my wire brush that I clean my grill with) I then season it lightly with Pam on a paper towel, making it easier each time for the deeper cleaning. I finally found my “Awesome” miracle! Love Awesome! We use it on just about everything. Even when the car gets extra dirty! I also heard of putting your oven racks in a large trash bag with amonia and let sit out on your porch overnight. I heard this on the radio show, Listen to the Mrs. Its a great fun show that gives out household tips and recipes on AM 790 in michigan. They also run the show live online from 10 am to 11:30 am mon-fri and 10 to 11 on saturday. I have heard for cleaning oven racks and for bar-b-que grills it helps to lay them in the grass over night, then first thing in the morning while there is still dew on them you scrub them – supposedly there is some natural chemical in the dew that disintegrates the grease. This is what I do and it really works! I just toss them out the night before and clean them first thing in the morning. My mom’s rule was to only clean the oven when we moved.